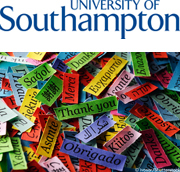 These resources are created and hosted by eLanguages, a research and development team in Modern Languages and Linguistics at the University of Southampton. eLanguages has created a range of online courses and resources. To find out more about what is available from eLanguages, see the menu on the left. The first set of resources support the massive open online course (MOOC) in Understanding Language: Learning and Teaching, created by the University of Southampton and available through FutureLearn. The next running of the course starts on 11th June 2018. The second set of resources support the MOOC in Developing Your Research Project, created by the University of Southampton and available through FutureLearn. The next running of the course starts on 18th June 2018. If you are a student you may access and use these learning resources freely for the purpose of learning. If you are a teacher, learning advisor or represent an educational institution in the UK or elsewhere in the world, you may use these resources for non-commercial, educational purposes by linking to this homepage URL or to individual pages (URL) of any of the items. The intellectual property rights in these resources shall at all times remain the property of the creators. You may not disassemble, decompile or reverse engineer any of the content, including the individual learning resources. In this activity, you will consider certain aspects of an e-tutor's role. In these activities you will familiarise yourself with some of the features of the lexicogrammar of ELF. This activity will help you familiarise yourself with some commonly used terminology related to different kinds of academic reading material you may encounter as a researcher. This activity will provide you with practice in scanning a text for specific information when researching. This activity will provide you with practice in skim reading a text to get the main idea of what it contains for research purposes. This activity will help you understand how academic argument is constructed and the core elements it is likely to contain.